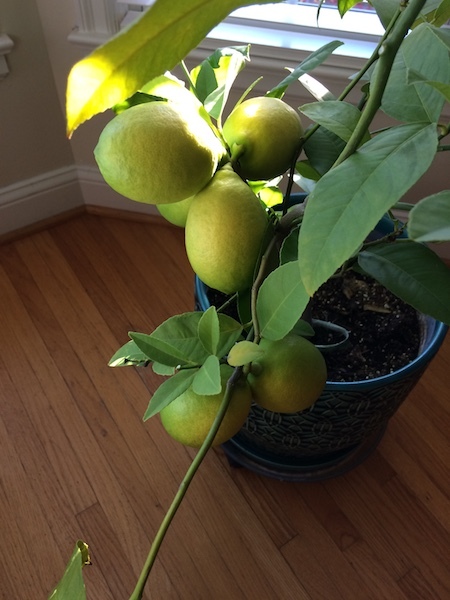 I’ve been watching this sweet little Meyer lemon tree for months — and it’s finally ready to harvest. Yes, you can grow lemons in cold climates (even here in Minnesota), if you have a sunny window and give them some outdoor time each summer. 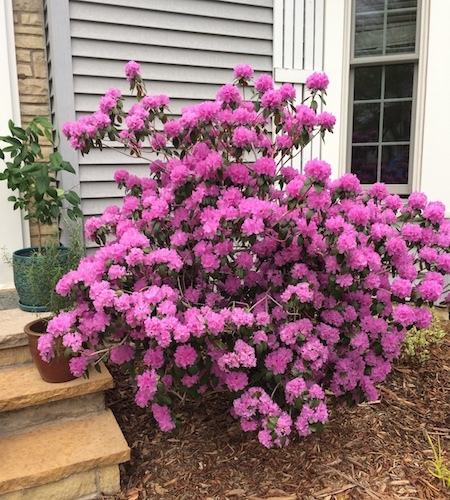 In May, the tree (on the steps behind the rhododendron) spent about a week going in and out of the house as it got used to outdoor conditions. I got this lemon tree sometime in late 2016 or early 2017. It was just a little stick when it arrived, but I transplanted it into a good-sized container and gave it two homes. From early October until late May, it resides in our sunny front window, which faces south. In summer, it moves out to the back patio, where it enjoys about 6 hours a day of sun and the benefits of rain, which is so much better for plants than tap water. 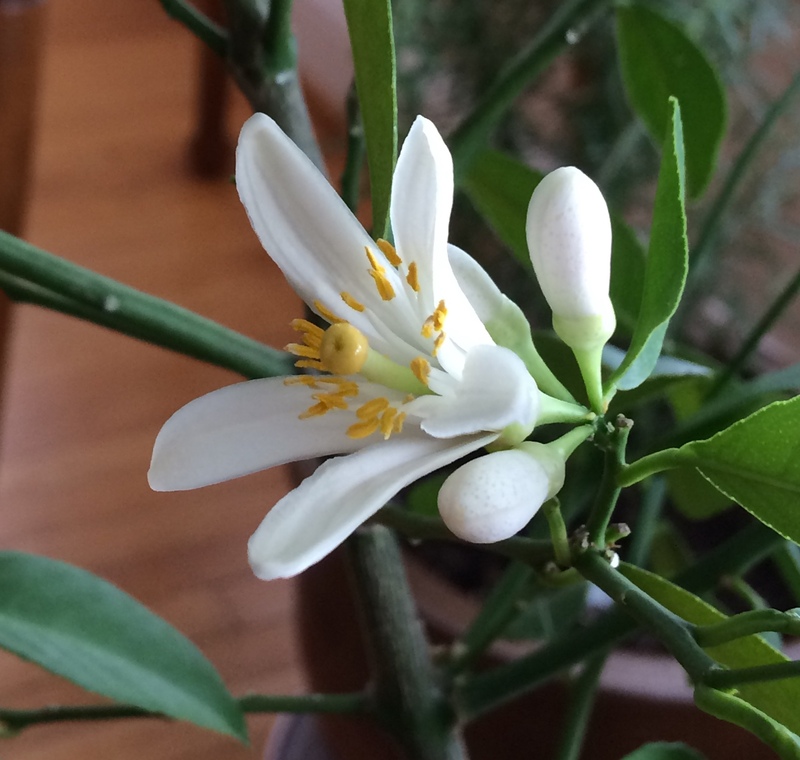 I admit to being skeptical about whether it would flower or fruit, despite assurances from fellow northern gardeners that Meyer lemons are the best ones to grow indoors. Sure enough, in late March 2018, it started blooming! I was so excited that I immediately looked up whether I would have to pollinate the flowers like an oversized bee to get fruit. Fortunately, Meyer lemons are “self-pollinating,” meaning they do not need other plants or bees to create fruit, though if you have more than one tree, you probably will get more fruit per tree. The flowers have a beautiful scent and I admit to waving my hands around to blooms to see if I could help the pollination. Lemon blossoms are beautiful and fragrant. Just the thing to perk up a gardener at the end of winter. It must have worked because by the time the tree moved outdoors for summer, it had eight tiny lemons on it! During the summer, the lemons got bigger and bigger. The tree is a bit lopsided because most of the fruit grew on one side. Even with all the squirrels, birds and rabbits in my back garden, seven of the lemons survived the summer and came inside to finish maturing. It takes a long time for lemons to mature in the North, but this past week, I decided to harvest a few to make a lemon pie. This is what the lemons looked like on October 20. They needed a bit more time on the tree. Be patient when growing lemons in the North. Meyer lemons can take a more cold weather than other types of citrus, but you don’t want to leave them outside once the first frost hits. I moved mine indoors about the 10th of October here in USDA Zone 4. In the house, seek out the sunniest spot you have. My south-facing front window works great for a Meyer lemon tree. You don’t need to go overboard with watering. I wait until the soil in the pot starts to feel dry about an inch down. This is about every two weeks. When I water I give the pot about 8 cups of water. Do not fertilize during the winter! The only fertilizer I put on my tree is fish emulsion. In 2018, I gave it a small dose in April after the blossoms formed and more in June, July and August. There are special fertilizers formulated for citrus, and the usual recommendation is to fertilize monthly from April to September. Be patient. It takes a long time for citrus to ripen, especially in the North. My Meyer lemon fruit was green all summer and finally started to change color in September. I tested one lemon in October and it was good, but not quite ripe. When I juiced the fruit for the pie last week, it was perfect. 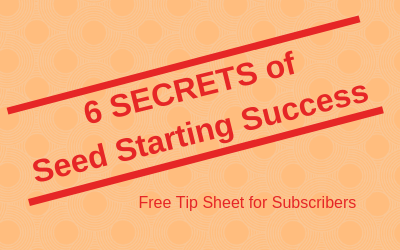 You will be rewarded! Compared to store-bought lemons, my homegrown Meyer lemons were incredibly juicy. It took just four small lemons to get more than two-thirds of a cup of juice for the lemon pie I made. Crust. I love making pie crust. If you don’t, no shame. Buy a frozen one. They taste good and are very easy to use. You do have to bake the empty crust before adding the filling. Filling. This is basically a fortified lemon curd. Adding the corn starch will make the pie set up more firmly and cut neatly. You do need to strain it as it’s almost impossible to make without a few lumps. Tartness. I like a tart pie — and this one is really lemony. 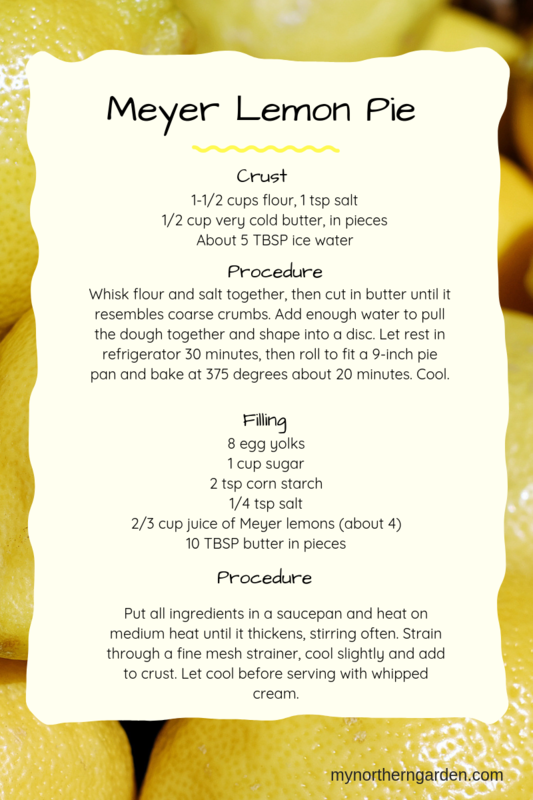 You could reduce the lemon juice to maybe half a cup for less tartness. The flavor also mellows out the longer the pie sits. Making this early in the day or even the day before you plan to serve it is fine. Keep it chilled. What do I do with eight egg whites?? You could make a meringue to top the pie. My family likes it better with whipped cream on top. I whipped the whites, added cream of tartar and sugar and made a meringue cookie. You could also use them in omelets and other egg dishes. In the picture the lemons look really big, more the size of oranges. Are my eyes playing tricks on me? It may be the angle of the shot, Kathy. They are good sized lemons — and super juicy — but not as big as an orange.